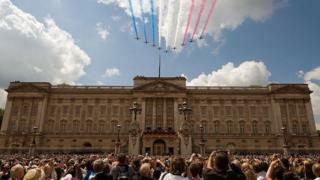 Funding for a multimillion-pound refurbishment of Buckingham Palace has been approved by MPs. They backed changes to the Sovereign Grant - the funding formula for the monarchy's official duties - by 464 votes to 56. The grant will increase by 66% to pay for the £369m refurbishment. Officials say the essential work - set to take 10 years - is needed to avoid the risk of "catastrophic building failure". Ageing cables, lead pipes, wiring and boilers will be replaced, many for the first time in 60 years, amid fears about potential fire and water damage. Two Labour MPs - Rushanara Ali and Dennis Skinner- were among those who opposed the move, along with 46 from the SNP. At a time of austerity, this significant increase in the money given to the royals has attracted little public criticism and minimal parliamentary scrutiny. It was very different in the 1990s when the government suggested spending taxpayers' money on repairs to Windsor Castle after it was damaged by fire. Two decades on, the Sovereign Grant increase has been approved after a committee of MPs considered the matter briefly, and after an overwhelming Commons vote in favour. Next month, the Queen's funding will rise from £43m to £76m. And it will rise each year, for the next 10 years. The focus now is on appointing consultants and finalising the refurbishment plans. With the builders in for at least a decade, the Queen may be tempted, at times, to replace her crown with a hard hat. A review by the Royal Trustees - who include the prime minister and the chancellor - agreed that works to the palace should be funded by a temporary increase in the Sovereign Grant. Profits from the independent property business Crown Estates go to the Treasury, which in turn gives 15% of the sum to the monarch in the form of the Sovereign Grant. The grant will be raised between 2017 and 2027 from 15% to 25% of Crown Estate profits. An online petition calling for the royals to pay for the refurbishment rather than taxpayers attracted more than 145,000 signatures. But Shadow chancellor John McDonnell, who describes himself as a republican, said he backed the taxpayer-funded restoration, calling the palace a "national monument" that needed to be preserved. The Queen will remain in residence during the work, which will begin in April. The palace will also remain open to visitors, due to the decision to phase the works over a decade. A Buckingham Palace spokesperson said preparatory work will now begin on the "re-servicing programme". "The first steps will be to appoint a programme director and tender for consultants. We will also finalise the design and planned phasing of the programme."